Nora June knows just what you can do with your pumpkin spice latte. 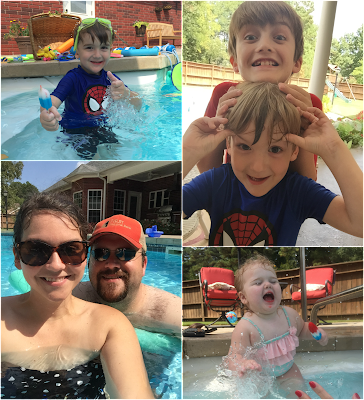 Like most, we spent the three-day weekend in the pool. Unlike most, we did not celebrate it as a kiss goodbye to a season. We still have a few weeks left to go, and I intend to enjoy summer to the last drop. Even if the forecast calls for a rainy week in my neck of the woods, there's no hint of autumn around here. Football fans spent the weekend with sweaty brows and wet shirts, the leaves are all bright green, and the summer sun could still cook an egg on the back porch. It's legally, officially, and clearly still summer. Hang tight, all you sweater lovers, it's going to be around for a little while. Have a Happy Wednesday, y'all! I'm with you: summer is not over until it's over! I hope you enjoy every minute of it. Last weekend was crazy hot! I went to Walmart yesterday and they have sweaters on the racks, and fall scents in the air freshener section. I'm SO ready for fall.